Removal of percentage reduction restrictions for commercial, industrial and other non-residential water users. All customers must adhere to the Water By-law at all times and are strongly encouraged to use water responsibly. 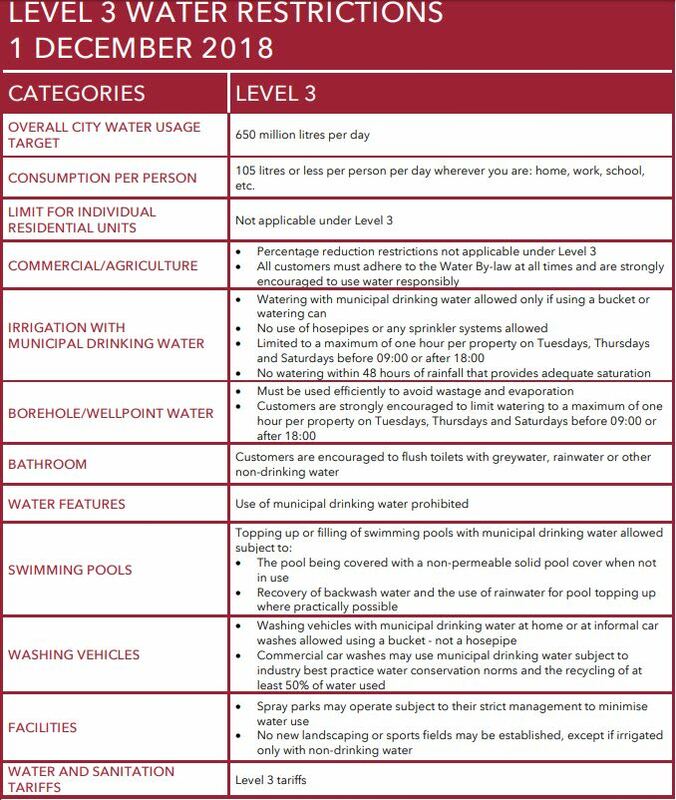 Removal of Level 5 restriction measures applicable to residential properties using more than 10 500 litres per month. All residents are strongly encouraged to use water responsibly. Topping up or filling of swimming pools with municipal drinking water is allowed subject to 1) the pool being covered with a non-permeable solid pool cover when not in use and 2) the recovery of backwash water and the use of rainwater for pool topping up where practically possible. Commercial car washes may use municipal drinking water subject to industry best practice water conservation norms and the recycling of at least 50% of water used.